Aniline poisoning is frequently seen in chemical industries since several decades. Aniline is a solvent used in dyes, antioxidants, rubber accelerators, drugs, photographic chemicals, isocyanates, herbicides, and fungicides. It is an oxidizing agent and is rapidly absorbed through the exposed routes. , Aniline compounds are well known to cause oxidative stress and thereby methemoglobinemia and hemolytic anemia. Here we present two cases of aniline poisoning leading to methemoglobinemia and hemolytic anemia. Here we present two cases of occupational exposure to aniline fumes leading to methemoglobinemea and hemolytic anemia. A 45-year-old male patient came to the emergency ward with a history of exposure to chemical fumes at work, in a pharma company in Mysore. The details of chemicals were unavailable at the time of admission. The patient was conscious, oriented, and on examination bluish discoloration of the skin and tongue was seen; he was extremely cyanotic and complaining of breathlessness, dizziness, and tingling sensation of extremities gradually increased over 2-3 h. Immediately on his arrival, high-flow oxygen therapy was instituted along with bronchodilators and hydrocortisone. Aniline poisoning was suspected and 75 mg stat dose of methylene blue was intravenously administered as per standard treatment protocol. Arterial blood gas analysis was performed, which showed significantly elevated methemoglobin levels and was suggestive of respiratory acidosis. In the meanwhile, the chemical fumes inhaled by the patient were confirmed as aniline by the company officials. Few hours after methylene blue administration, a repeat arterial blood gas analysis showed drastically reduced methemoglobin levels. The patient on a later stage was diagnosed to have hemolytic anemia due to methemoglobinemea. A 24-year-old male patient, who works in a pharmaceutical company was admitted to the emergency department with the complaints of difficulty in breathing, 3-4 episodes of vomiting, confusion, and disorientation. The patient presented with a history of inhalation of fumes of caustic water mixed with chemicals. Details of chemicals were not known at the time of admission. On examination, bluish discoloration of skin and mucous membrane, respiratory distress, and epigastric tenderness was seen. As part of symptomatic management, high-flow oxygen therapy was instituted, along with bronchodilators and hydrocortisone. 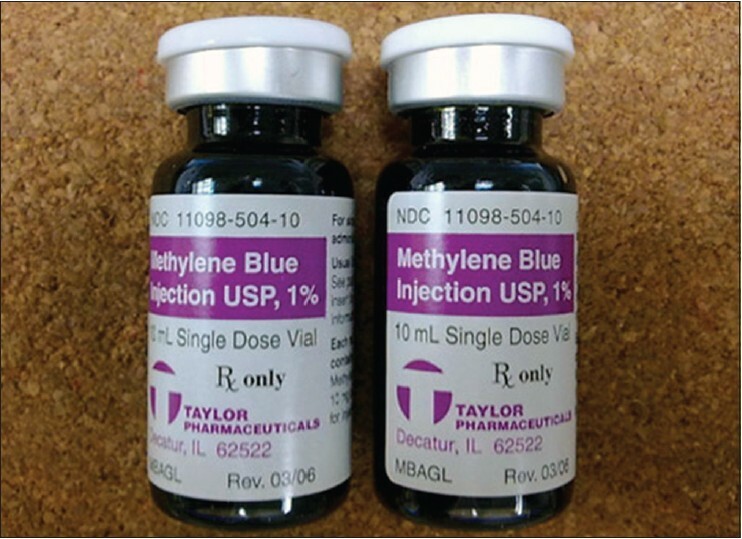 Aniline poisoning was suspected and 75 mg stat dose of methylene blue was administered intravenously. On enquiry pertaining to the chemical fumes inhaled, it was later on found from the company officials that, the patient inhaled fumes of 4-Bromo- 2-Fluro Aniline. All laboratory investigations were normal except FmetHb (methemoglobin fraction) (normal < 1.5%), which was found to be elevated (3.4%) suggestive of methemoglobinemia. After receiving three doses of methyl blue, patient's FmetHB levels reached near-normal values, but red blood cell count has significantly reduced from 4.71 to 3.20 trillion cells/L suggestive of hemolytic anemia. Aniline has previously been implicated as a methemoglobin-producing chemical, but the mechanism of action for this response has not been fully elucidated. It has been postulated that a metabolic transformation of aniline to an oxidative metabolite is necessary for the production of methemoglobin. Phenylhydroxylamine has been identified as the possible toxic metabolite. So methemoglobinemia in the patient can be attributed to occupational exposure of aniline. Hemolytic anemia developed in these patients could be broadly attributed to aniline poisoning and antidote used, that is, methylene blue as both aniline and methylene blue could cause oxidative stress, which destroys the red cells in the blood. Some studies suggest that the patient with glucose-6-phosphate dehydrogenase (G6PD) deficiency are more prone to get hemolytic anemia  ; however, G6PD in these patients was not determined. The seemingly innocuous inhalation exposure to 4Bromo-2Fluro aniline can lead to life-threatening methemoglobinemia. Strict measures should be fostered to possess specific antidote at all times in sufficient quantity in every company that makes use of chemicals so as to ensure safety and wellbeing of employees. Available from: http://www.shpir.hps.scot.nhs.uk/htm/hps/documents/cirs/26094.htm. [Last accessed on 2014 Jul 23]. Kearney TE, Manoguerra AS, Dunford JV. Jr. Chemically induced methemoglobinemia from aniline poisoning. West J Med. Feb 1984; 140:282-6. Liao YP, Hung DZ, Yang DY. Hemolytic anemia after methylene blue therapy for aniline-induced Methemoglobinemia. Vet Hum Toxicol 2002;44:19-21.